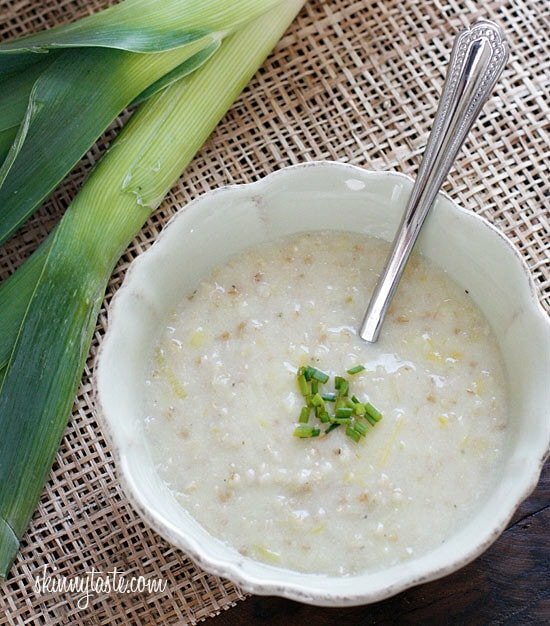 This classic Irish Oatmeal Leek soup also known as Brotchán Roy, traditionally served during Lent. I love the creamy texture of a hearty bowl of oatmeal soup – total comfort food! I’m no stranger to oatmeal soup; growing up some of my favorite soups Mom prepared were made with oats. More hearty comfort soup recipes I love are Cheddar Corn Chowder with Bacon, Potato Leek Soup and Roasted Brussels Sprouts and Cauliflower Soup. When I first discovered Brotchán Roy, otherwise known as the King’s Soup, I knew I would love it. It was said to have been the favorite dish of Ireland’s celebrated sixth-century spiritual and literary icon, St. Columkille. Steel cut oats are loaded with fiber, they are great for your heart and give the soup a wonderful texture. If you don’t have steel cut oats, you can use Quaker oats, reducing the cooking time to about 25 minutes. If you’re on a gluten free diet, make sure your oats are labeled gluten-free. This is my modified take on the classic, hope you like it! 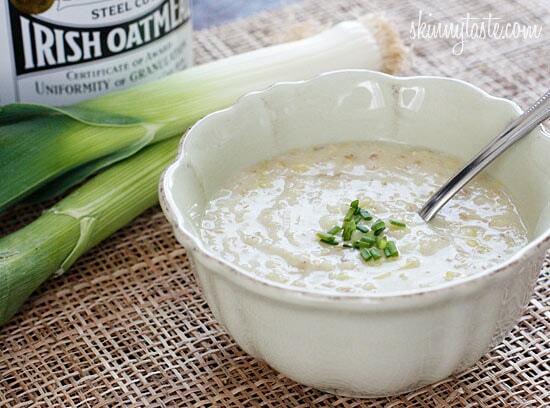 This classic Irish Oatmeal Leek soup also known as Brotchán Roy, traditionally served during Lent. I love the creamy texture of a hearty bowl of oatmeal soup – total comfort food! Melt the butter in a medium saucepan over low heat; add the leeks. Cook, stirring occasionally, until the leeks are soft, about 15 minutes. Add the broth and milk; raise heat to high and bring to a boil. Add the oatmeal and fresh cracked black pepper to taste. Return to a boil, stirring occasionally; reduce heat to low. 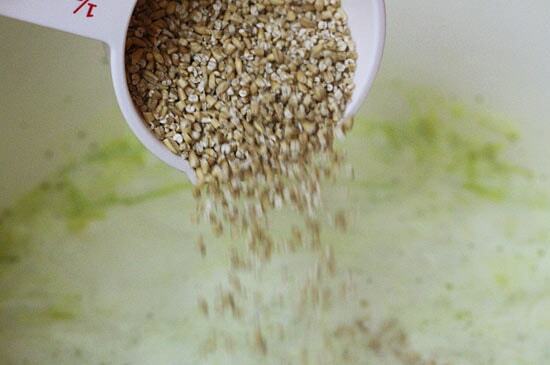 Cover and simmer gently until oats are tender, 45-50 minutes (less if using Quaker oats). This soup is delicious! I did cream it to hide the leeks from the kids, but they devoured it! No complaints when they asked about the ingredients. I gave them the summary on the soup above and they were more focused on wondering why it was called King’s Sou as they ate it. Will definitely make it again as it is a comforting soup. I’ve made this several times before, tonight I am going to add some baby portabellas to it and see how that ends up! Four out of five at the table loved it, only one fuss-budget was undecided. Used a hand blender for a smooth and creamy big mug of soup. Delicious! I would really recommend using a stock pot for this. The amount of liquid used in this recipe comes nearly to the top of a medium sauce pan and as soon as it starts to boil, the milk wants to boil over onto the stove. Very messy. A friend made this a St. Patrick’s day dinner. It is awesome. Very tasty. Perfect to take to my St. Patrick's potluck at work, a big hit! i gave up meat for Lent AND have a hubby who is an Irish citizen- double win for us both! will be making to St Paddy's Day! I know this comment is 4 years old, but for others wondering it reheats EVEN BETTER the next day. The oats have a chance to plump up even more and it becomes less like soup and more like porridge. SO GOOD! This soup has no right to be this good. How did you get yours to look so creamy, though? Mine turned out more the consistency of French Onion soup. Sounds like you needed to simmer it longer. I just made this tonight and I can't say enough fabulous things about it! Thank you for another great recipe, Gina! I have leeks in the fridge and the oats in the pantry. There is winter storm happening right now, I am totally making this!! I have had this recipe tagged for almost a full year. I live in a rural area and it's so hard to find leeks at the grocery store! Anyhow, I made this yesterday. It was delcious. I do have a question about the portions…I made this exactly by the recipe, but my soup exceeds four – 1 and 1/4 cup servings…Is this a simmer issue? Should I have simmered longer? It wasn't as thick and delicious as yours appears visually. 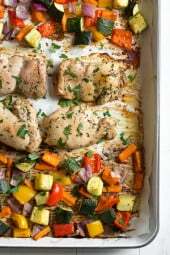 Loved the recipe and I love this blog! Yes, if you had more liquid, and it wasn't as thick, it sounds like yours needed to simmer a little longer, maybe uncovered a few minutes. Different pots and stoves can be the issue. Very tasty. Perfect on a day when I was feeling sick and craving something warm and comforting. I was hesitant at first, but my GOD!! This is yummy. I have made it a dozen times over the last year or so. The family loves it too, and there is never any left over. Ummmm, YUM! I was a bit wary of this at the start but glad I made it. I added a bit of salt and some lemon. Deee-lish. 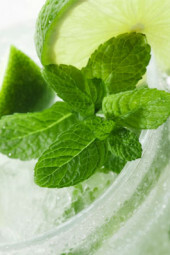 Thanks for the recipe – everyone needs to make this! I had to try this because of all the comments, both negative and positive. I wanted to know for myself how this tasted and I LOVE it. Soooooo good. I did add garlic to the leeks. Can't wait to make this! 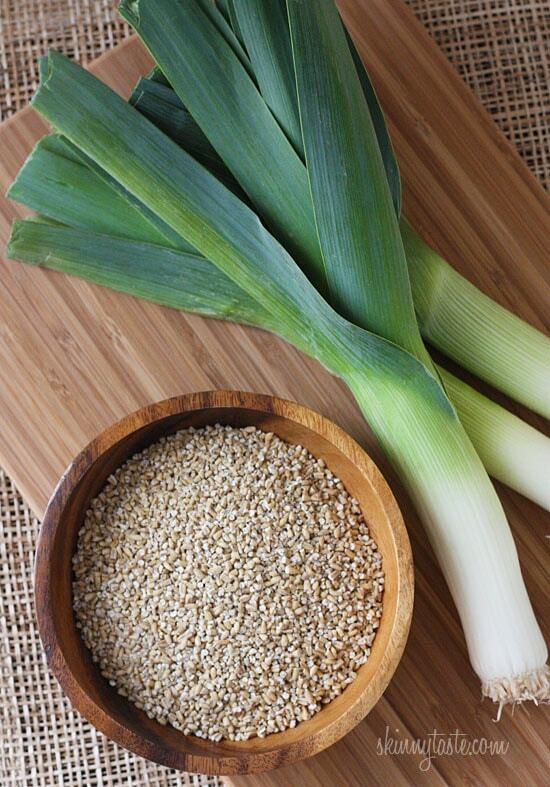 I have frozen leeks ala Trader Joe's in the freezer… We have long been on the steel cut oats bandwagon. I've never heard of oatmeal in a soup! I'm gonna have to work up the nerve to try it! Amazing recipe! Initially I wasn't convinced but I gave it a try. So easy, quick and yummy!!! Thank you for another great favorite. If I just used some of the broth to sautee the onions so I can leave out the butter or would it not be the samee? This recipe is amazing! Family loves it too, and I've already made it three times. Today I wanted a 'fix' – not having leeks I tried sauteed onions and mushrooms. Delicious. Thanks – I'll be making this soup for the rest of my life. I've been reading your blog for some time now, and I've made a number of dishes (all of which have been incredibly delicious). I am finally commenting, though, because this soup is simply too wonderful to ignore. After a long day at work and chilly temperatures outside, I wanted something comforting, hearty, and warm for dinner. I'm so glad I made this! Thanks for posting the recipe! I served this last night at a fund raiser for our theater, and it was the hit of the evening. Add a slice of soda bread and it becomes a meal in itself. When you calculate the recipes do you put them into the WW website and save them, where we can make adjustments? Hmmm…. I wonder what would make a good substitute for the milk. Does anyone think that non-fat greek yogart or soy milk would work? Well it is not greek yogart. Have to go to the store and try again tomorrow…. I used almond milk and it worked great! Made this tonight. SSSSOOO good! I'm putting it back on the menu for next week. We all (the 8, 5, and 1 year old included) loved it. LOVE your blog. Please never stop helping others find healthy food that is delicious! loved it! was skeptical – usually associate oatmeal with sweet/morning food only, but this was lovely. creamy without being heavy, savory, the leek flavors really shine and all while still being light! only thing i did differently was that i added half an onion (and i doubled the recipe to serve a crowd). Ok, I was one of the biggest cynics out there after getting this recipe via email. I mean, I was once accused of not cooking anything unless it came in a box or can…and I wasn't even sure what a leek was and I am not ashamed to admit that I googled it to find out! Having said all that, however, I did just happen to have a box of Irish Oatmeal that I had picked up on clearance when my husband was on an oatmeal kick (and did I mention that I am not a big oatmeal fan, either??) I figured the leeks couldn't be too much ($2.98 for a bundle of 3 that was more than enough for this recipe), so I gave it a shot tonight…. This is wonderful! We thought it sounded gross but after all the comments we decided to try it. Both my husband and I LOVED it! I made this last night and it was amazing! If you're turned off by the oatmeal in it, it has the same texture you would find in a chicken and rice soup. Thanks for another hit Gina! Wife and I were a little skeptical the first few bites in (I went super light on the crushed black pepper as I wanted to make sure it would work for the whole family) but after actually doing the black pepper to our own taste we fell in love. Combined this with some fresh French Bread grilled cheese sandwiches and it was a fresh and savory meal. GREAT WORK! I loved this soup so much. I was kind of skeptical of oatmeal in soup, but figured that I've never gone wrong with your recipes before. It was really delicious. Thanks. This soup is delicious!! My 10 year-old son was licking the bowl and my husband was scraping the pot for the last remaining spoonfuls. Thanks! Gina, you continue to amaze. I was VERY leary of this, but since I've LOVED everything else I've made from you I decided what the heck. I've never been a big fan of oatmeal (except in cookies); but WOW – my only issue is there wasn't enough left-overs, I guess I'll be making a double batch next time. Tonight I'm trying your Crustless Spinach and Feta Pie, I'm sure it'll be great. You are cheating yourself if you don't try this soup! I made it tonight and it was so delicious! I have oatmeal almost every day for breakfast, and I LOVE leeks especially in soups but don't always have potatoes around to keep my Irish soul happy. I've never had oatmeal in soup before, but decided to try making this soup as a lent-friendly friday night dinner tonight (by Friday night I always need comfort food and a glass of wine). I'm soooo happy to have a new way to make a leek soup. This is DELICIOUS!! I tried this out of curiosity and I'm glad I did. It was delicious. The only change I made was using unsweetened almond milk instead of dairy milk. I would definitely make this again, thank you! I do too! I eat mine with fat free cheddar cheese and turkey bacon. Looks really tasty. It makes me think it would be a bit like a savoury porridge. I love coming across new ideas. This looks like a win-win: healthy, hearty and frugal! I buy steel cut oats in bulk and would love to use them up in a few more ways than just breakfast oatmeal. I was won over when I saw the pic of all the leeks. I have calculated the points on this and am wondering if I'm doing something wrong. I calculate the entire batch of soup as 10 points which makes it a total of about 2.5 points a serving, not 4? I have to admit, my husband and I were questionable because of the steel cut oats but this soup is OUTSTANDING!! We loved it!! Thank you for posting!! I made this dish last night for dinner. I was skeptical at first, but since I had all of the ingredients on hand (except leeks) I decided to give it a good college try. It is one of the best soups that have ever hit my taste buds. I served it with garlic rubbed bread that was toasted in a pan. DELICIOUS! Ultimate comfort food! I made this last night on a whim. My very picky family loved it!! I just finished the left overs for lunch and can't wait to make it again. So simple but so yummy! I made this last night and it filled the house with a delicious aroma. I warmed it up for lunch today and it is just as good as it was last night. Fantastic! This looks so amazing. I love the idea of oatmeal soup. YEA! I love all your recipes! i've made about 4 or 5 now! I recently joined WW and this is making it very easy to stay within my points and eating wonderful food. I started a blog about my journey and i've posted pictures of your creations i've made. (I have cited you on my blog) I wanted to make sure it was ok I mentioned your website! Take a look and let me know if I can continue doing so. I made this for dinner tonight and it was incredible!!! I added one shallot and about 1/2 cup green onions (because I had 'em) and I used Brummel & Brown for the butter and Silk Vanilla Coconut Milk. There were no leftovers, darn it!!! This recipe will definitely go in the 'keeper' file! Thank you! …and for the previous 'anonymous' question, NO, this does NOT taste like Cream of Celery (yuck!). This is rich and decadent! I'm fascinated, can't wait to try this out!! What do you think would pair well with this? I had mine for lunch with a salad and a crunchy slice of sourdough bread. The soup is filling and you don't need much to go with it. Delicious! I also pulled it out of the fridge the next day and heated it in a coffee cup for a lo cal filling breakfast on the go and it was just as yummy! I have never had oatmeal soup, what a great idea. Thanks for sharing this. Love the idea of oatmeal in soup! What a lovely Irish recipe…perfect for this time of year. Thanks! I just finished making this and am slurping it down as I type! This soup is delicious and creamy and comforting and you must try it. I am soooo pleasantly surprised at how flavorful it is and the texture adds a great mouth feel. I pulsed mine in the blender and it's perfect! When I had my wisdom teeth out a few years back, one of the few things with any real body to it that I could eat was oatmeal. Getting tired of sweet, breakfast-y oatmeal, I made my oats with beef broth, garlic, and cayenne a couple of times. I love savory oatmeal! This looks delicious. What a great way to add creamy hearty richness to a soup, without using cream! Yes, adding a beef bone in the soup is how we typically do it in South America, gives it great flavor! That sounds like a great combo too! I also love the creaminess without the fat of cream and the oatmeal does the trick. Does this soup reheat well? I am excited to try it! Thanks Gina your recipes are always great!! This is just a random question that applies to a lot of your recipes — what brand of light butter do you use? Thanks! I like Balade (not sure of the spelling) from Trader Joe's or Land O Lakes. If you want to use regular you could, the points might remain the same but check to be sure. What do you think about sautéing the onions and then throwing it all in the crock pot for several hours? Does it taste like Cream of Celery? I love your recipes. You are the greatest. Gina – do you think this is freezable? I never had oatmeal based soup and can't wait to try this. Thanks!! I'm thinking it would freeze fine, it's delicious! My mum makes something similar – so good! The oats make it really creamy and satisfying. So interesting! I've never seen or heard of oatmeal soup before, but I'd love to try this soon. I suppose it's not so different from barley soup or similar — steel cut oats always remind me a bit of barley, texture-wise (but maybe that's just me). Must get leeks the next time I'm at the store! I've seen several recipes for oatmeal soup but have never tried it, though I've been meaning to. I've bookmarked this to try soon. Thanks for the beautiful inspiration. Wow…I didn't know people even put oatmeal in soups, but this looks really good! I've never had savory oats or oatmeal in soup…you have made it look delicious, though!! 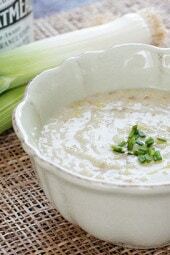 I am a huge fan of leeks, so I just might have to give this soup a try! I never knew you could have oatmeal in soup!!! I love oatmeal and I just so happen to have some steel cut oats in my pantry. I also am curious if soy or almond milk can be substituted for dairy milk since I am no longer eating dairy. I have loved EVERYTHING I have ever tried from your site. I know this will be good! I love oatmeal so I will have to give this a try. Gina has never steered me wrong! I have never never never been disappointed in a recipe from this site. Can this be made with almond milk or soy milk? my husband thinks he's irish. Must try this. You never steer me wrong! I just had to say that I love the 'thinks he's Irish'!! Oatmeal soup?! Wild! I haven't ever tried that before. I love leek soup so I must try this. Thanks! This sounds delish,I can not wait to make it! I've seen Irish Oats, but I haven't bought them. Your dish looks amazing, what a great spin on oatmeal. Perfect for a healthy dinner! I have to try this! TJ feel better, sending you a bowl right away!! Snap! I just read up on savory breakfast oats over on Vegan Epicurian a couple months ago. I love mine now with broccoli, mushrooms, red pasta sauce, onions, and cheese…… 🙂 Brenda the Barefootcookingirl. I never thought of having savory oats – we eat rice sweet and savory – makes sense! don't knock it til you try it! These thoughts were some of mine also. However, because Gina said it was good and the fact that the calories were so low, I decided to make it. OMG!!! This is so good. So savory. One serving is very filling – perfect for lunch! Added a fat free ham/cheese sandwich for dinner. Honey loved it too. 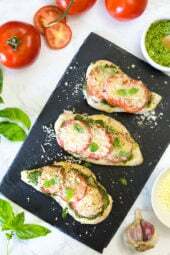 I love this website and use a lot of recipes found here and I have never been disappointed in the taste and ease of preparation. This is so good. 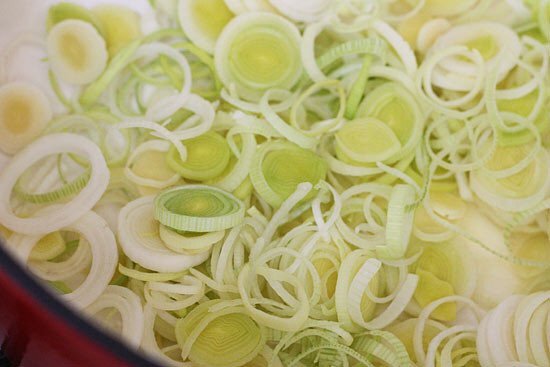 I had an Irish grandmother who would make something like this, but I think she used onions instead of leeks, probably because she was cheap. I am not a fan of oatmeal at all, but this is so interesting, traditional yet not well known, I urge anyone to try it. You'll be surprised how good it is. Love Oatmeal and I love leeks so Im defo gonna try it! Why would you take the time to post such a silly and ignorant comment? If you do not want to eat this soup, don't eat it. No one cares what sounds good or not good to you. I'm actually glad that someone posted this comment. It gave others a reason to elaborate and explain, like J Beaman. I have yet to ever try a soup like this, and personally I think it sounds a little weird/possibly gross. But hearing that others too thought this, then made it anyways and loved it makes me even more inclined to give it a try. So while the comment was silly perhaps, I'm glad it was made and that it encouraged others to speak of their expectations/experiences. Ooohh, this looks delicious!! A wonderful Lenten dish!